Equinox Sounds has announced the Complete Dubstep Bundle, a collection of 3 sample packs for Dubstep, Dub Tech and Grime producers. You’ll get a total of 27 Construction Kits. Includes ACID/WAV, Apple Loops, REX2 and MIDI formats. Rigorously Dubstep — 5 Construction Kits for creating cutting edge Dubstep and Dub Tech. With consistency of key, BPM and sound throughout this collection, it offers versatility and creative control. Raw Dubstep — The audio version of the MIDI sample pack collection ‘Raw MIDI Dubstep’ from Equinox Sounds. It features 10 Construction Kits for creating nasty Dubstep and Grime plus the ‘Raw MIDI Dubstep’ pack included as a bonus. The audio Construction Kits are available in ACID/WAV and Apple Loops formats. Subconscious Dubstep — A collection of 12 Dubstep and Grime Construction Kits with some deeper and darker journeys into the electronic substrata. Featuring 2-Step beat patterns layered over 1/2 time Dub patterns, heavy atmospherics and an emphasis on precisely warbled, filtered & mutated subfrequencies, this is a diverse collection of Dubstep loops. 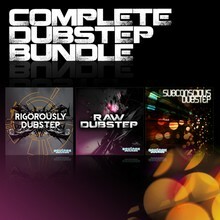 The Complete Dubstep Bundle is available to purchase for $29.95 USD.